Sonam Kapoor and Anand Ahuja hosted a special screening of Sonam's film Ek Ladki Ko Dekha To Aisa Laga. Sonam Kapoor is all set to release her film Ek Ladki Ko Dekha To Aisa Laga where she will be seen for the very first time with her father Anil Kapoor. 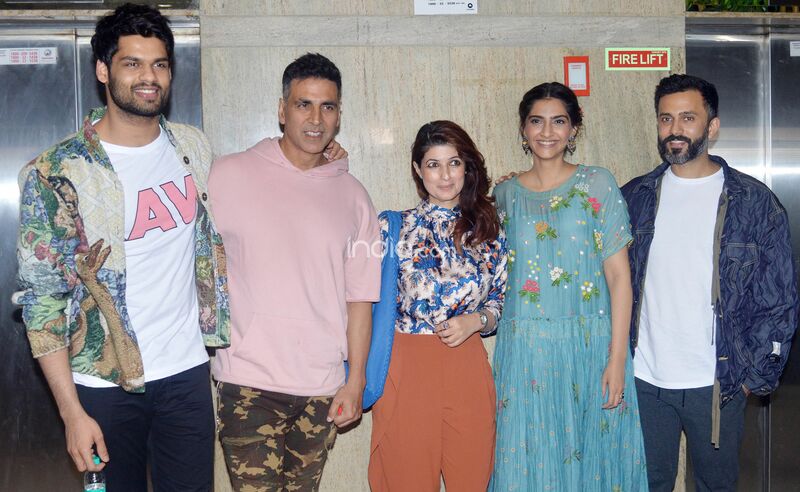 Ahead of the release of her film, Sonam hosted a special screening for Akshay Kumar and his wife Twinkle Khanna. Along with them was also present Sonam’s husband Anand Ahuja. Sonam, Akshay, Twinkle and Anand posed for the paparazzi in their beautiful outfits. Sonam donned a light-blue floral gown. With subtle makeup, hair tied in a bun and long earrings, Sonam looked lovely as she posed for the shutterbugs. Anand, on the other hand, kept it casual in a white t-shirt, blue joggers, and a crushed denim jacket. He teamed it with a pair of peach sneakers. Akshay and Twinkle looked lovely as well. Twinkle donned a white top with blue floral prints. She teamed it with a pair of orange trousers. Aksay, on the other hand, kept it cool in a pair of camouflage shorts and a pink sweatshirt. “Why should I reveal the plot of any film? We are not hiding anything, everybody can see what is in the trailer. I am just saying why we should label anything. It is a lesson that is being told that there is no difference between any love in this world,” the Neerja actor added. In Ek Ladki Ko Dekha To Aisa Laga, Sonam is seen playing the role of a woman who falls in love with another woman. However, she has to deal with society’s unworthy questions about her relationship. South-star Regina Cassandra is seen playing Sonam’s love interest in the film. The film also features Rajkummar Rao, Juhi Chawla and Sonam’s father Anil Kapoor in important roles. Directed by debutant Shelly Chopra Dhar, the film is slated to release on February 1, 2019.